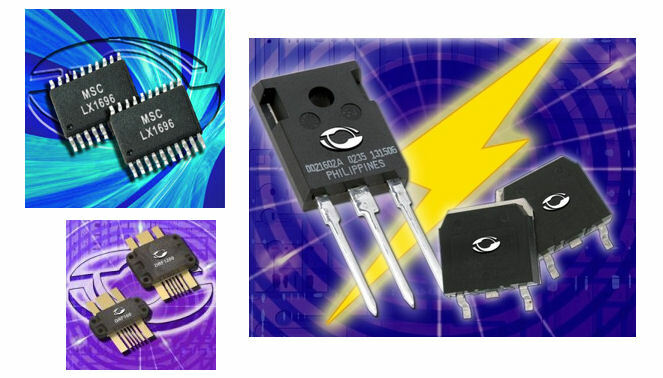 Microsemi offers the largest selection of discrete components (diode, transistor, MOSFET) for the Hi-Rel markets: Space, commercial and military Avionics, Defense & Security, Medical, Industrial and Transportation. Products include high radiation-hardened MOSFETS and bipolar Transistors, Rectifiers, Schottky diodes, Transient Voltage Suppressors, Analog and Mixed-signal ICs, Power management products, RF discrete from 0.5 MHz to 110 GHz, RF Power Amplifiers. All the discrete parts are available in a variety of packages for pth and smt production technologies.The widest selection of MIL qualified Diodes, Bipolar Transistors and Protection Devices (TVS) for Hi-Rel industrial, medical and mil-aerospace applications. Radiation Hardened bipolar transistors and power MOSFETs for Space applications. RF Diodes (PIN/Limiter, Varactor, Schottky, GUNN Oscillators,VCOs and Tranceivers). RF Power Transistors (BJT, GaN, SiC) for ground and avionic applications (Radio Communications, Interrogators, Transponders, L-band and S-band Radars). RF Subsystems: Power Amplifiers from 100 Mz to Millimeter Wave, LNA, Narrow Band, Broad Band, Log Video Amplifiers, Multipliers. Power Switching IGBTs, Diodes, Mosfets and Modules.